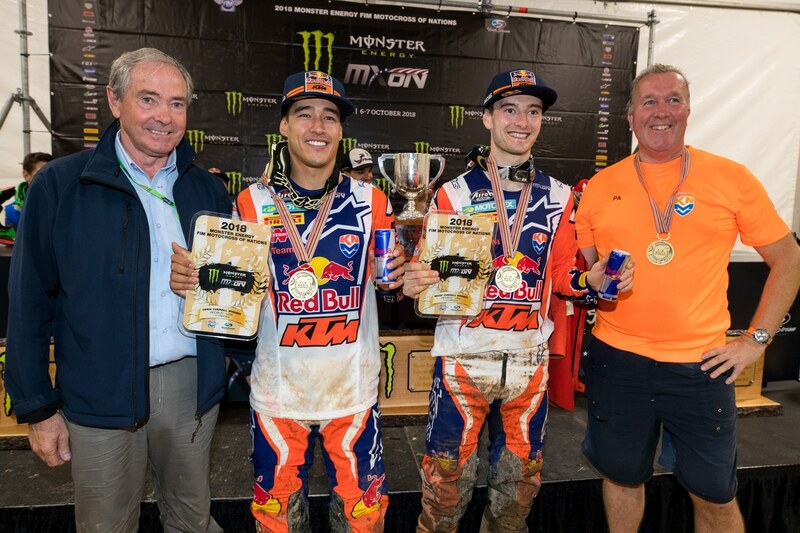 Glenn Coldenhoff and Jeffrey Herlings of team Netherlands holding up their 3rd place trophies. 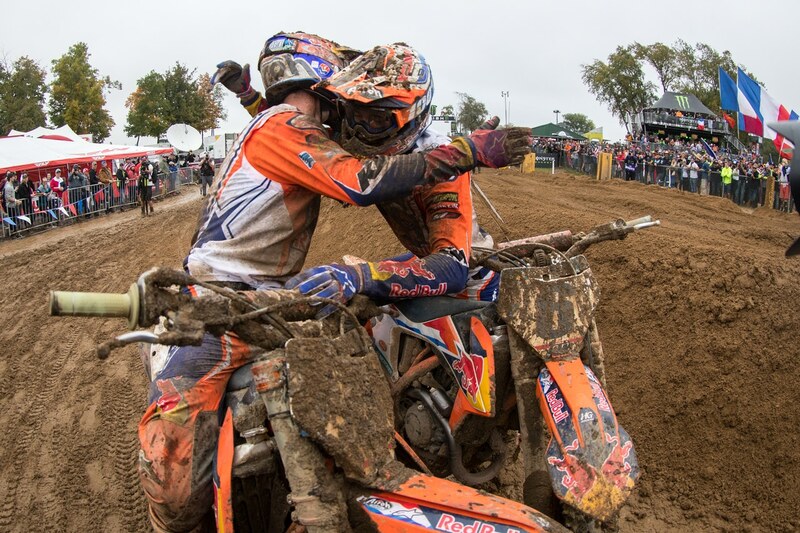 Of course, we all knew the Dutch rider Jeffrey Herlings would be good at the 2018 Motocross of Nations Red Bud round. But not everyone knew teammate Glenn Coldenhoff would actually be the dominant rider. 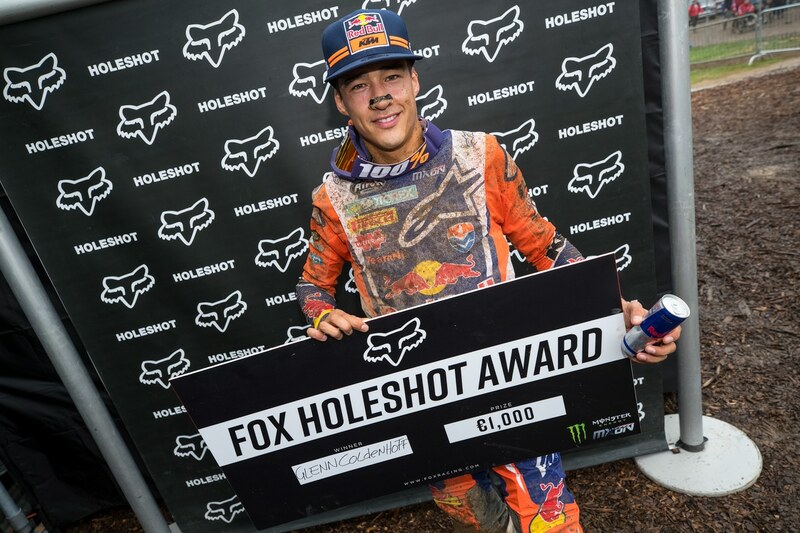 By winning both “Open class motos” Coldenhoff showed the world that it was not only Herlings that was the premier Dutch rider. In what may be his last race for the Red Bull KTM Factory team in Europe, the 27-year-old showed that on any given day, he can be the fastest man on the planet! We had a chance to grab Glenn for a few minutes before the celebrations began in the team Netherlands tent. GLENN, TALK ABOUT THE MOTOCROSS OF NATIONS. YOU CRUSHED EVERYONE! I knew my start was important here because with all the math, and all the rules, you do not want to get in trouble. I was leading so that was definitely a good feeling, especially on this track here at Red Bud. It was kind of crazy, and I love racing here in America, and I really enjoy it. The atmosphere here was unbelievable, you know? Every year there is a lot of crowds to the Motocross of Nations, but here with such a big venue, there are people everywhere. For myself, it was the post prestigious Motocross of Nations that I have ever done; so, it was amazing. NETHERLANDS HAS ALWAYS HAD A STRONG TEAM, AND YOU WERE THE BEST TEAM. Yes, we could have won had Calvin (Vlaanderen, MX2 rider) not been injured. We only needed him to finish. He would have raced his second moto if the doctors had let him! We feel good about our racing. We will be ready for the 2019 MXoN in The Netherlands! LET’S SWITH TO YOUR 2018 MXGP SEASON. YOU FINISHED 7TH OVERALL BUT WERE ACTUALLY CLOSE TO TOP 5. At a few GP’s, I did not score any points. One race I had a crash in Russia because of someone else, and then I had zero points at that race. Another time, I think in Indonesia, in the second moto there I got penalized with a yellow flag, which I really could not see. That cost me ten places, so in that GP, I almost did not score any points. Otherwise I would have been very close to the top 5. But in the end, I have been very consistent, have been there every weekend with the top guys. I just missed out on the podium three times, but it is what it is. I HAD HEARD THAT YOU WILL GO TO A DIFFERENT TEAM NEXT YEAR? Yes, that is true. KTM still has Paul Jonass on contract, along with Tony (Cairoli) and Jeffrey (Herlings) of course. At that time when I started speaking with some teams, Red Bull KTM told me there was no room. 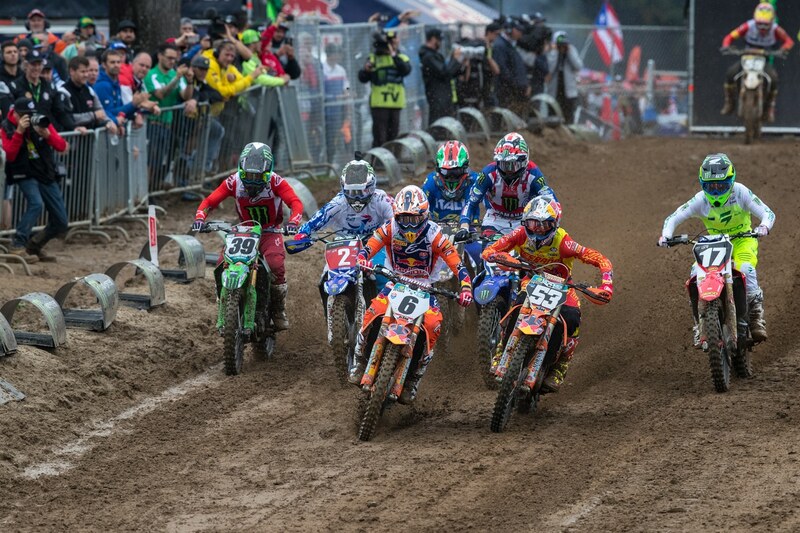 They had three riders, already two in MXGP with Tony and Jeffrey, and they did not want four riders in MXGP because Jonass was going to move up. So, at that time there was no place for me, but now things are looking different. I signed with the team whom I rode with in 2013 (Standing Construct KTM), and that is the year that I broke through a little bit. I know the people, and I know the team. They are very good people there, and I know I am in good hands. MAYBE YOU WILL CHANGE TEAMS FOR 2019, BUT YOU WILL STILL BE ON KTM. WILL YOU GET SOME FACTORY PARTS. Yes, for sure. KTM was very happy with me, and I have been with them for three years. Standing Construct KTM is also a high-quality private team, so I will get some support from them, and some still from the factory. I think that is good, you know? I have a very good relationship with KTM, and also am going to stay with Red Bull. It is always good to have those guys (Red Bull) behind me. IT DOES SEEM LIKE KTM REALLY IS VERY HAPPY WITH YOU. For me it is the same, and I am very happy with them. I really like the people, they are easy to work with, and they are so professional. The organization is unbelievable. I would say that they are for sure one of the best teams out there. I am very blessed to be with them for these three years, and I love all the people working there.